Next, the tea cups. Where can you get all different and super cheap tea cups and saucers? Well Goodwill of course! I didn't pay more than $1 for any of these. My Goodwill didn't have a super great selection but hauling around a 2 year old to different stores just wasn't "my cup of tea"! For the adhesive, I picked up a tube of caulking while I was at the ReStore. This, too, was only $1. First, I glued the cup to the saucer using the caulking. After those were dry, I glued the saucer to the pole. Not too hard, huh?! I had also planned to drill a hole at the bottom to drain the water. This turned out not to be so great an idea. My drill didn't penetrate the cup AT ALL! So if some rain gets in, the cup becomes a bird bath instead of a bird feeder: both very functional. Check out my very own National Geographic Live! Now, I know some people do everything they can to keep squirrels out of the bird feeders but I don't mind so much. Plus, I can't really help it. But, the birds are coming to visit too!!! These photos are little fuzzy because they're super zoomed in. I'm very happy with how they turned out. Total cost: $7. Awesome! How adorable! One day when I live in a house instead of an apartment I want to do this! I love it! Found you at Someday Crafts. Oh wow these are so sweet! Thanks for sharing it, I might have to try it for my backyard! Oh, I LOVE these! I will have to make some! I love everything with tea cups!!!! Oh, I L-O-V-E this! I linked your project under my Inspirational Projects section on my blog ... can't wait to do this around our Koi Pond. Cute. Did you know that the blue cup and saucer are from the Currier & Ives "The Old Grist Mill" set? I also used those cheap vases that flowers come in. Can find them at goodwill for 50 cents. Got some poles from Lowes and painted them. They work great and are really cute gift ideas!!! Fantastic idea. I love it. That will have to be a project for me...I love the rehab store and Goodwill and I love each other! Thanks for sharing. Just wanted to share that you've been featured on our SMITTEN: SPRING 2012 GUIDE! I love these. I've got to make some for my yard! May I feature you on my blog http://blogtheblacksheep.wordpress.com? It's a blog about fiber art, but I can't resist this...maybe I can incorporate some fiber in there somewhere!? Maybe you could glue velcro to the bottom of the saucer and top of the spindle, then they would be removeable for cleaning. Just a thought! Thanks for sharing - I'm going to make some of these! Last week I bought some table legs from home depot for a table I made for our backyard from an old habitat door, and I have one extra leg. So My plan was to make one of these. Yours turned out cute! fun! Awesome, I have to make some of these. Theya re fabulous and can be stored easily during bad weather. I love this idea! Do you mind if I pin this on to one one of my Pinterest boards? Kathy, of course I don't mind. Thanks! I think she meant $10 each a total of $30 for 3.. I love these! I am making them for my Mum for xmas. She loves tea cups and birds...so they are perfect! Thank you for the idea. You can use a diamond bit to drill the china. And make sure you use a glue that is made for china and wood. Or your china will not stick to the wood and will fall off and break. I doubt that caulk is made to hold china and wood together. By drilling with a diamond bit through the cup and saucer, you could have then joined them with a screw and glue. If you are going to make something, do it right to last. These are adorable. I just made three of them from my Goodwill treasures. Thanks for the inspiration! These are so cute. I thought at first that they were used to set your cup, etc. on in outdoor space. But, what a neat idea for bird/squirrel feeder. Love it! Thanks for sharing. My name is Rockie and I'm a stay at home mom to these two amazing little tornadoes! I love to craft and make my own things as much as possible. I am so happy that you visited my little blog. I would love to hear from you so please leave some comment love! 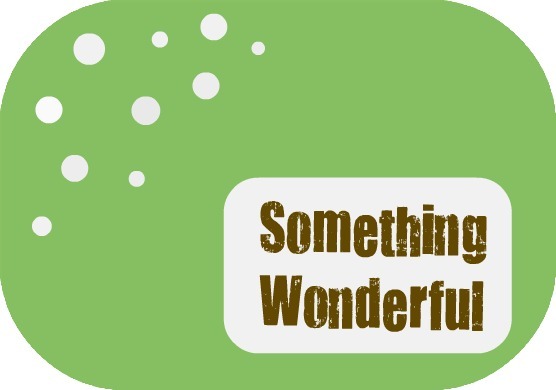 I hope you find Something Wonderful!